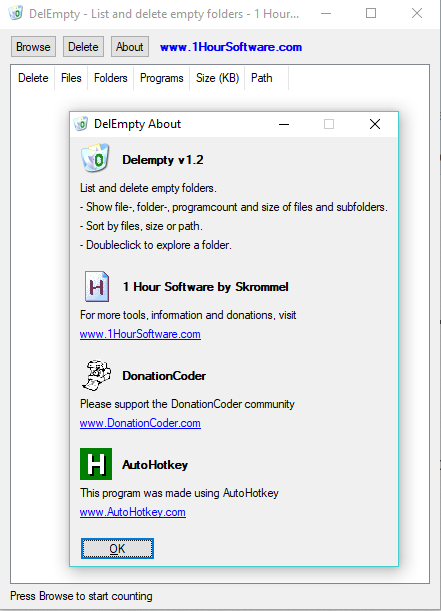 This program will find empty folders on any drive or single folder you choose to scan. It will list the empty folders and check them for deletion by the user. - Show filecount, foldercound, programcount and size of files and subfolders. - Sort by files, size or path. - Doubleclick to explore a folder. 336 540 Skrommel's One Hour Software <img src="https://www.oldergeeks.com/downloads/gallery/thumbs/DelEmpty1_th.png"border="0"> Nov 23, 2018 - 13:20 1.2 255.6KB ZIP , out of 6 Votes.